The NAED PAR Survey is open. If you are interested in the 2019 survey, complete the interest form here. 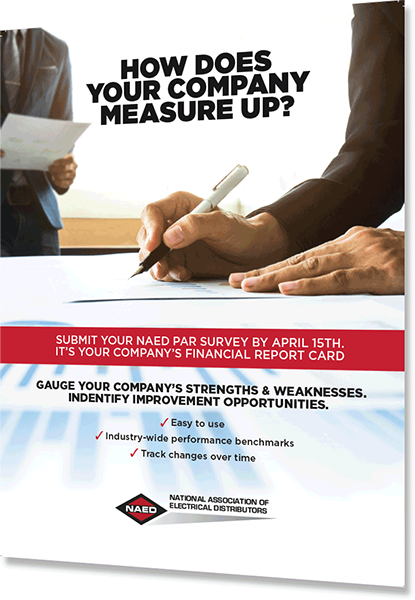 Regarded as one of NAED's most popular offerings, the results of the NAED PAR Survey provide benchmarks for distributors' key financial categories. The final report offers distributors an up-to-date picture of their financial performance on operations, assets, and sales. Additional breakouts for sales volume, customer segments, number of locations and regions are also included in the report. Note: This report is not available for download via the e-store. Please contact Member Engagement to obtain your copy. Audience: Annual financial benchmarks provide insights to anyone working in strategic, operational, financial, or sales-related roles. *This report is not available for download via the e-store. Please contact Member Engagement to obtain your copy. 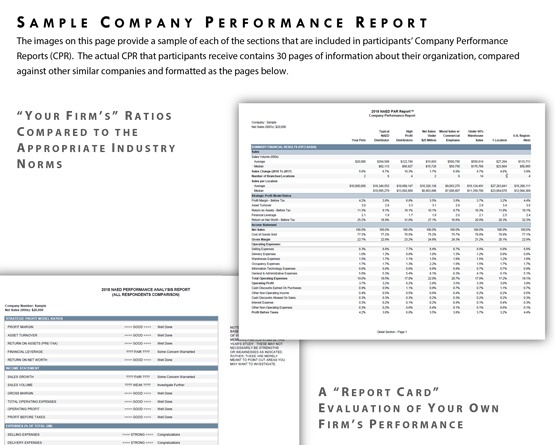 The images provide a sample of each of the sections that are included in participants’ Company Performance Reports (CPR). The actual CPR that participants receive contains 30 pages of information about their organization, compared against other similar companies and formatted as the pages below. Growth and sustainability in the face of the ecommerce uprising. View this large cross-industry compensation study.